365 Day Diet Pill takes the very unique approach by supplying you with an entire year’s supply (365 days) of it’s slimming supplement and charges you approximately $80 in the process. The official website promises that if you take the product in accordance with the supplied directives you will have more energy, additional lean muscle mass and be given extra incentive to follow the program meticulously. Advertised as a “thermogenic formula” it is a slimming capsule to be taken once a day, although the recommendation is to take twice a day – this though makes the product effectively the 182.5 Day Diet Pill as the content will only last half as long. The man focus does appear to be on the cost effectiveness of being able to buy a year’s supply which works out under $7 a month. 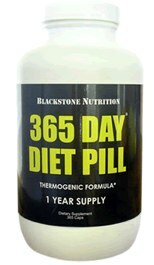 365 Day Diet Pill contains three sources of caffeine, and is very much stimulant based. The amount of each ingredient is not elaborated on. There is little scientific or clinical evidence to support the claims. Customer testimonials are few and far between. Some of the plant-based ingredients can also cause allergic reactions or other side effects in the gastric system. Chromium has been shown to be potentially toxic in large doses. 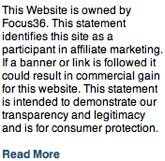 The product is now discontinued – but when it was available it was via the official site only. The manufacturers inform on the official website that the product is now discontinue and recommend Apidexin in its place. Apidexin is a fat burner that is based on a similar formula to the 365 Day Diet Pill. This entry was posted in Fat Burners and tagged 365 Day Diet Pill, 365 Day Diet Pill review. Bookmark the permalink.